I am not a big dessert person, but I love brownies. I have a real weakness for a good brownie, especially these brownies. I am totally addicted to them! The topping really makes these brownies. It is packed full of almonds, almond extract and bittersweet chocolate. SO delicious! Don't be alarmed that the brownies bake an additional 17-20 minutes once you add the topping. The brownies won't be overdone. I promise! These brownies are really rich, so have a glass of milk handy. They are also good topped with a scoop of vanilla ice cream. This might be my favorite brownie. Heat oven to 350°F. Grease the bottom of 13x9-inch pan. In large bowl, combine all brownie ingredients; stir until fully incorporated. Pour into pan. Bake or 25-28 minutes. Remove from oven. In a small bowl, beat softened butter and brown sugar until light and fluffy. Add 1 egg, and 1 teaspoon almond extract; blend well. Stir in chopped almonds and chocolate chips. Spread filling over baked brownies. Return to oven; continue to bake an additional 17 to 20 minutes or until light brown. 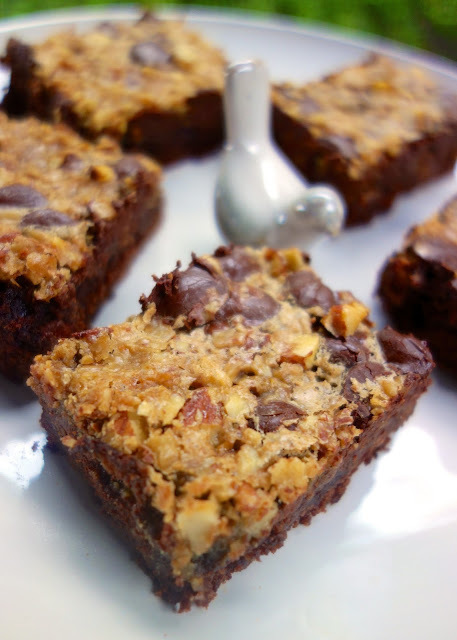 Allow brownies to cool completely and cut into bars. 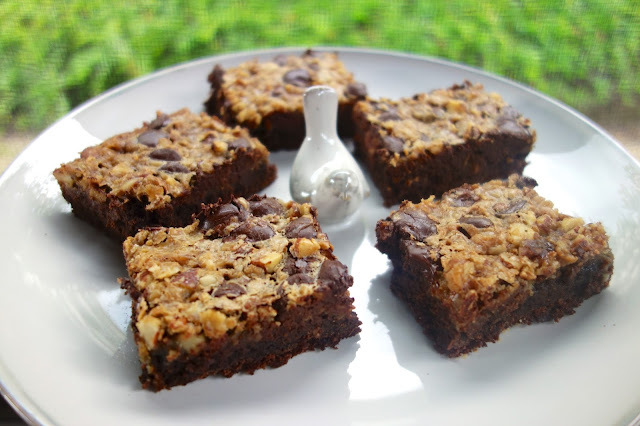 Love the combination of chocolate and almonds. YUM!